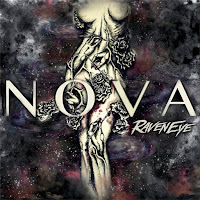 One thing is for sure, UK based rock trio Raveneye certainly got themselves a solid headstart for the release of their upcoming debut record. Bearing the mark of frontman Oli Browns’ award winning talent, the band has quickly earned itself a hefty touring resume unlike any other band having self-released their first set of songs, playing alongside Deep Purple, Slash and on world renowned festivals such as Hellfest Open Air and Download. Furthermore, the bands’ debut record ranked up second in Loudwires’ polls for “Most Anticipated release” alongside Airborne and Opeth. The band, who’ve have promised to perform “Hero” on Ghost Peppers were they to reach one of the top positions in the polls, were glad to find that I happened to have more than a few to spare for their undertaking. After having warned the Oli and Aaron about their entertaining but poor decision-making regarding Ghost Peppers, we jumped right into the main subject of the interview that is NOVA, the bands’ widely anticipated debut. Since this is your debut release. What can audiences expect from this first album? Oli: Well first off they’re all new songs. We didn’t regurgitate the songs from the EP. We wanted it to be an wholesome experience from start to finish, all written for the purpose of the record. We worked on 25 songs and had them all ready to record in the studio, so we picked the ones that we thought fit the whole color of the record, in order to have the whole story and order that we really wanted. So there’s certain overarching narrative to the record? Is it a concept record. O: In some ways. We didn’t so far with it that you can’t listen listen to it on shuffle. We didn’t want it to be that thing where you’re stuck listening to it a certain way some songs always connect with people differently. We didn’t want songs to be crossing over to the next because we didn’t want it to be a disorientating listen when you listen to each track separately. Originally we did want to do a more tied-together concept but for this record we eventually realised that we wanted it to be about each individual song, but the whole record still paints the same picture. What kind of subject matter do you deal with on this record? O: The peaks of them though. All of the things that move us in life basically. The title of this first record, NOVA, obviously refers to its original latin meaning but also evokes a cosmic vibe that I feel is reflected in the music. Was an atmosphere that you were working with during the writing process or did the title and labelling come afterwards? A: I think it was kind of serendipitous. We decided on the word but then when we looked at it a little closer we realised that it did all relate so intrinsically to everything. O: We had no idea that it was latin for “New” at first, like you said. Aaron: Then you’ve also got Nova as an explosion. O: We originally thought of calling the record Supernova but it would’ve put too much focus on one song. Plus I don’t really like the long album names, some of them really work but for our first record we wanted something short. A: And like you said the term reflected the size of the sound that we wanted to go for. We wanted to go for something that was massive. The room that we recorded in was huge, we had mics up in every corner and we used every channel on the desk to make sure that it sounded massive for a three piece. So that was the spatial concept that we were going for as well yeah. Oli, This debut record as Raveneye comes after the release of a few solo blues records of your own. Do you see Raveneye as a “next step” or rather a complementary project in your career? O: It definitely is a next step. When we went into this, I was with a label and management agency and I just didn’t want to do that anymore. I wanted to start again, I wanted a band to start things from scratch: no agency, no management, doing it ourselves. We still are pretty DIY; we drive everywhere ourselves, we tour manage ourselves, we’ll sleep in the van… That was something that we wanted when we started this out, this would be our next step to build our own lives, with people that really believe in our choices rather than just going “Oh ok, you’re the artist, we’ll have you do this”. We’re involved in every part of this business as well as in the music. We wanted to be independent and work with people that respect our work. Has this changed some of the dynamic when it came to writing or your way of operating as an artist as a whole? O: Totally, and this was the intention as well. I enjoy being a solo artist but there’s a certain disconnect that you get with your musicians. I mean there is a connection, but they’re still hired people, whereas in a band there is a relationship and a lifestyle that we live. We live and breathe Raveneye. It’s not just doing the gig and learning the songs, this is our lifestyle now. The best way to describe it is when we’re writing our songs, we’ll all work on building the tracks to where they need to be, at the finishing point we envisioned. It’s not for ego or saying “my part is better!”, we all want to work on delivering the best song. When you first started playing together, was there a specific idea as to the sound you were going for? 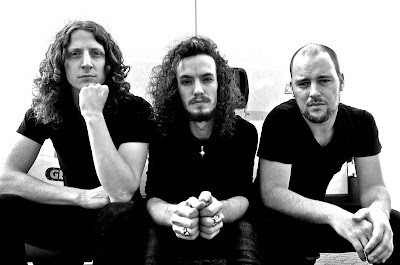 How did the sound of Raveneye come to shape itself? A: We were lucky that at the start of Raveneye we had some tunes that Oli had already written, he wrote the EP. So we had these songs as a template to come from and got the vibe straight away; the riffing, the killer guitar solos… so we kind of developed what Oli had set in place to write the new material on the road and tour this stuff. In the two years since your inception you’ve already stacked up an impressive resume: shows at Hellfest, Download, opening slots for Deep Purple, Slash with Myles Kennedy… How did this all come about, given that you’re only just releasing your first record? O: (laugh) Well the Slash thing was pretty incredible because he had gotten a hold of our single Breaking out. Someone had sent it to him and so they got in touch with us and offered us some european shows. He books his bands, which is really cool, he’s really involved in it, he really cared. We work hard on moving our stuff on and off stage and being the easiest band supporting. We try to be like ghosts, you can barely notice us, which I think is what helped us get the US tour with Slash as well, because we’re so low maintenance ! (laughs) They were really lucky experiences. At that point we started developing a team that believed in us as well, a good management that put the word for us and keeps an eye on these things. Deep Purple was a really lucking thing; their supporting band were not able to play two of the shows and we found the spot. It’s been an incredible ride. The EP was just for the UK, we just were trying to get noticed. We sent out hundreds of emails, made so many phonecalls, contacted everyone and pretty much no one replied (laughs). We didn't care though, we knew what we wanted to do and we went to achieve it. We’re really proud that it allowed us to make this record. What are the plans beyond the release of this record? O: We miss the music! (laughs). You’ve kept pretty busy since the start of the band though! A: And it’s always sort of cold-turkey. This is probably the longest time that we haven’t actually toured. We finished the record on June 1st and got back and we haven’t really played a tour since then. We’ve done shows here and there but we live for touring. When we realised that yesterday we thought “That’s why we’re going crazy!”. So you’ve come to crave for this routine after a while. O: Totally. We do a lot of work on our computer and we look after so much of everything that the bit that keeps us motivated is the touring and playing the music. The admin is so important to us but we can do that on the road as well. The more on the road we are, the happier we’ll be. We’re happy to be away for as long as we can. … It’s not the healthiest routine, might I add! O: Totally! You’re totally right! We try though! We stopped having McDonalds now. A: We try and eat as healthy as we can, make sure we’re fit and healthy before we even get on the road. But yeah, we really love touring. Certain artists need a certain time and space for the writing process. How about you guys? Were you able to write parts of the album on the road or solely in between tours? O: It was kind of a combination of both. At the start of the year we were hitting a bit of a dry period and at that point we didn’t really have enough songs either. We had a few songs that worked and a few songs that could work, but that wasn’t good enough so we got a hold of ourselves and wrote 20 songs and kept on pushing ourselves. But then afterwards we went to… Las Vegas? A: I think in an ideal world I would like to have some time off to write. I kind of like the idea of getting in a headspace. When we started writing, things were moving kind of slowly but then we ended up building a momentum and by the end of it, our first single “Hero” happened in a day. It was the last song we wrote and it just came out. Having the time is really nice but it’s not always a reality so … We’re happy to write on the road as well. … or in Hotel Rooms in Las Vegas. O: Instead of enjoying ourselves! A: It was cool actually because we got hooked up by Slash’s guitar player Frank of the Conspirators, his old man works in Vegas and was able to get us a really nice room. Normally we’re on a budget deal where we sleep in really dingy, crappy motels. A: Pretty much! But this was the one time in the whole tour that we actually had an amazing room, in this wicked hotel; 50th floor, looking out on Vegas. It was amazing… and we locked ourselves in a room and wrote a song. At least it was a nice room. O: AND at least the song made the album. O: If it didn’t make the album, this would be a different story! O: It was “Walls” actually, the single that we’ve just released this week. A: Well… Oli and I always end up sharing the same bed together on tour. (Laughs). Was the Wheatus concert around the time they had “Teenage Dirtbag” out? Could you name one of your favorite albums, movies and books? O: For albums I’ll go for Superunknown by Soundgarden. My favorite books are the Game of Thrones series, I’m obsessed with them. I know it’s not the most exciting answer though. For movies I’ll go with Saving Private Ryan, that intro is just devastating. A: Ok so my picks will be Grave Western Valkyrie by Rival Sons. My favorite book is Shogun by James Clavell. I recently read it again on an audiobook. It’s the size of the bible, it’s a massive book. It’s incredible. It’s about Japan, the Samurai and stuff like that. I do love movies… I might go with the Lord of the Rings trilogy, it’s just so epic. A: Be sure to check us out on our social media. You can find us there, it’s us at all times speaking to you. Get in touch! O: We actually tweeted yesterday that we’d be in Paris and we had lunch with some fans today! A huge thank you goes out to the band and to the staff at Him Media for making this article possible!